gmreynolds (profile) extended his winning streak to 24 games on Adam Vinatieri's 51-yard field goal as time expired in San Diego. The 25-year old California native had two NCAAF wins yesterday (Clemson and Boston College), and correctly picked the Baltimore Ravens win earlier today to get to 23. With only one game on the board for tomorrow the question now becomes - will the $1M come down to MNF? We'll have to wait and see. Sorry, JFulk89, The StreakMaster strikes again! The Atlanta Falcons ended his 24-game winning streak earlier today with a 45-28 victory over the Carolina Panthers. Our new leader, gmreynolds71283 is now at 23. 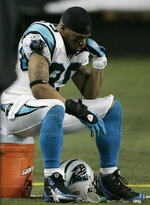 The other previous 23-game Streaker - girlie_girl21 - also picked Carolina and went down. This game can be so harsh. The picks are in! Both JFulk89 and girlie_girl21 have picked the Carolina Panthers to beat the Atlanta Falcons. We'll either have a winner tonight or gmreynolds71283 is sitting in the lead at 23. Ladies and gentleman, this could be the day we see a Streaker hit 25! Keep in mind that if JFulk89 wins his next matchup to get to 25, he is not automatically declared the winner. Both, girlie_girl21 and gmreynolds71283 have a chance to get to the magic number because of the three time-slots we have on the board. If multiple Streakers get to 25 today, the tie-breaker will be the entry with the highest winning percentage. Good luck to all! Today's NFL matchups include, The Eagles at Ravens (-1.5), Patriots at Dolphins (+1.5), and the Panthers at Falcons (pick'em). All three day games should be close, but, if The StreakMaster had to choose a "lock" it would be the Panthers. The MLS Cup has come down to two teams, the Columbus Crew and the New York Red Bulls. Columbus was the team to beat all season, and they are given the edge to win the championship by a half goal (-.5). ESPN sneaks in some college football on us tonight, with Connecticut on the road at South Florida (-3). Donald Brown has been great all season and should run for at least 120 yards and with South Florida currently on a three-game losing streak, it could be more. The StreakMaster is not sure why everyone still likes the Chargers this season. The past few years they have been up and down, and never reached their potential. LT might have a big game but the Colts should win this one, as they are finally clicking and making a run towards the AFC playoffs. 53.4 was the overall winning percentage, not bad for a Saturday. Today is the big day, however, because The StreakMaster has three Streakers to worry about. Rest assured fellow Streakers, The StreakMaster will not make this day easy for the leaders! We had two major streak breakers in Texas Tech, who finally went down to Oklahoma, and the England Rugby team whom just couldn't handle the World Champions, in South Africa.